LearnTech Help Desk Staff Reviewing a Help Ticket Survey. Photo by Scott Watkins. Feedback is essential to growth, and DELTA’s LearnTech Help Desk staff members are enjoying having a channel of feedback from help ticket surveys again. 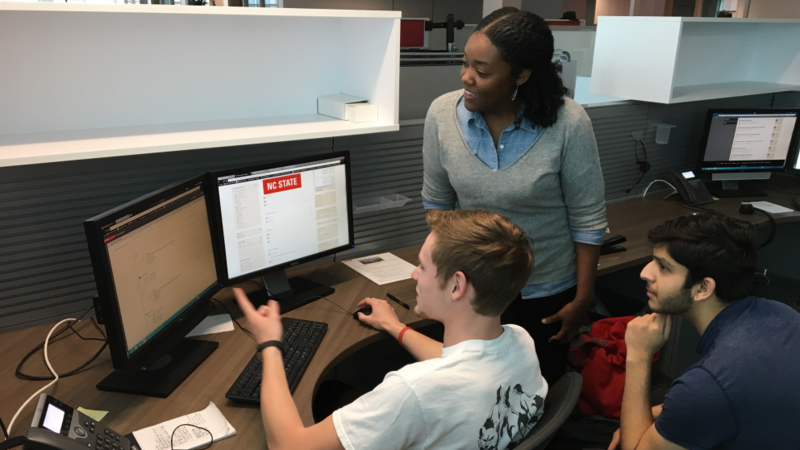 The LearnTech Help Desk provides phone, email and in-person support to NC State faculty and staff using instructional technologies like Moodle, WolfWare and Mediasite. 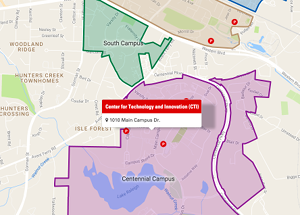 In December 2016, LearnTech re-enabled user feedback surveys after several months without them following the campus’ switch from Remedy help desk software to ServiceNow. After completion of a help ticket, the faculty member or instructor will automatically be sent a survey to evaluate the service received unless he or she has been sent a survey in the last 30 days by any help desk on campus. The problem was resolved in a timely manner. The Help Desk staff member was knowledgeable, helpful and courteous. They were kept updated about the process. The quality of the overall experience. Users are also able to request to have a supervisor follow up with them if they want further discussion. The surveys are a valuable resource for faculty because it provides them with a quick and convenient way to share their thoughts. As more help ticket users respond to the surveys, LearnTech can further refine and enhance its help desk services. According to Associate Director of Instructional Technology Support Scott Watkins, the surveys give the LearnTech staff insight into when they are doing something right and when a task could be improved on. Each person who handles a help ticket can see the responses of that specific ticket. “It is a way for the team and individual staff members to assess their own effectiveness,” Watkins said. “As a manager, I can see the whole team’s feedback and can analyze the data. Over time, we can monitor the quality of our service to better recognize trends or spot anomalies,” Watkins said. Along with recognizing points of improvement, the surveys give the LearnTech Help Desk staff a way to acknowledge staff for their achievements. “We like getting back positive comments,” said Watkins. LearnTech staff members have also started to engage in friendly competition, with a recognition of the team member whose help tickets get the best ratings each month. According to Watkins, the feedback received so far has been positive and should continue to increase as more help ticket users complete the surveys.